Having completed 6 days walking on 2 sections of the Camino de Santiago in Northern Spain last September, 2 of our group decided to try another section in May this year with another new pair. Our plan is to walk from the French border at Irun through the Basque country to Bilbao over a week or so. 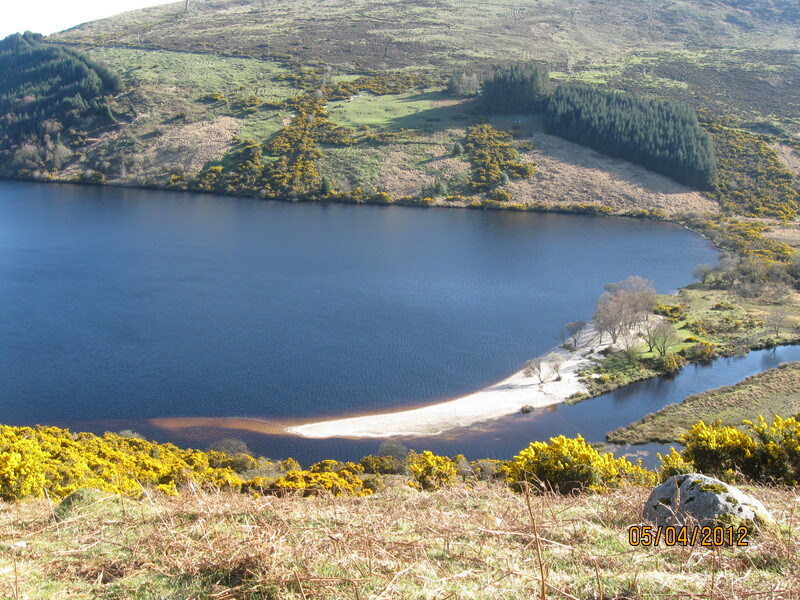 To get in shape for the tough Basque hill country, I have been doing walks around Wicklow, including the Cloghoge Valley between Loughs Dan and Tay. 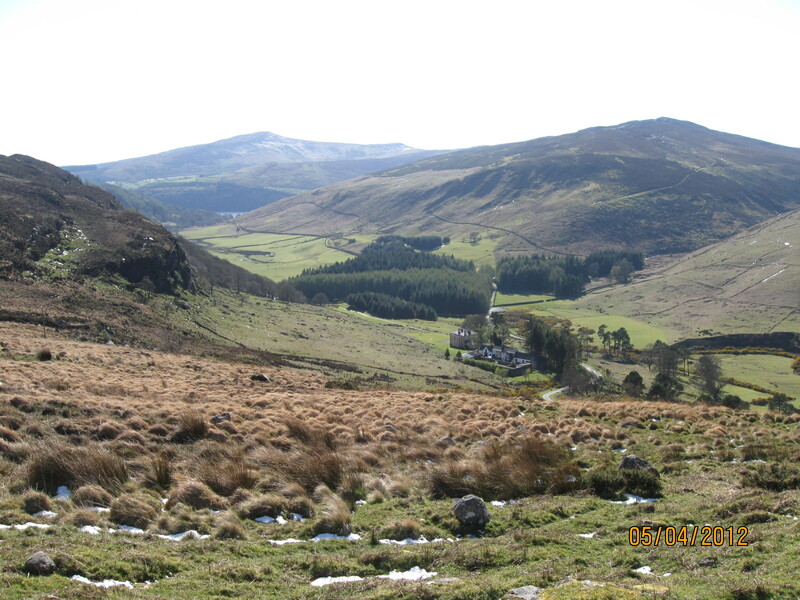 Using David Herman’s “Walker’s Companion – Ireland” as my guide, I set off on a beautiful early April afternoon from the car park overlooking Luggala, residence of Garech de Brun. 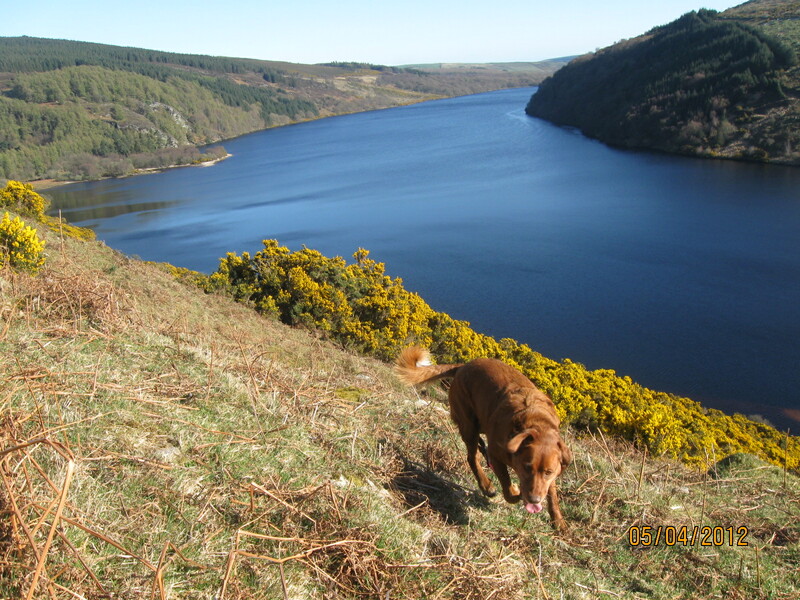 With my dog Toesun on his lead, we descended the steep hiilside to the valley floor alongside the Cloghoge river. 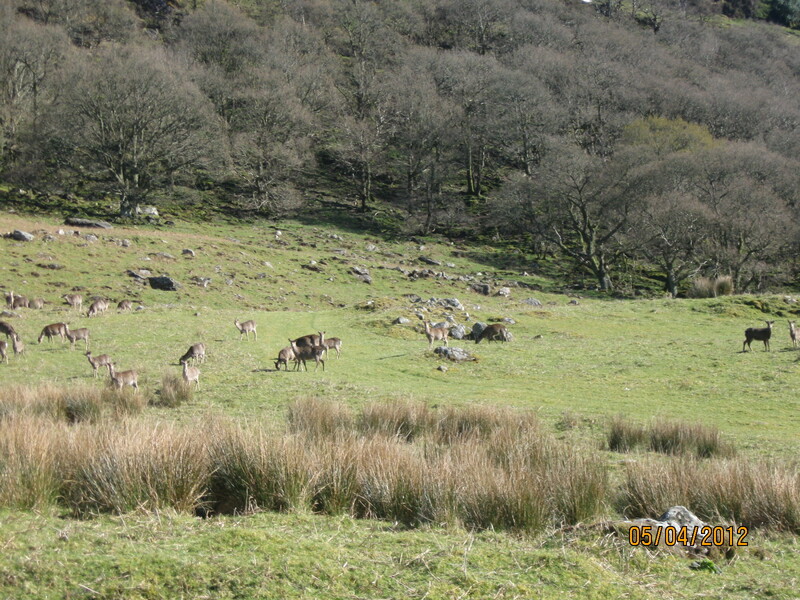 All around us were deer grazing, numbering in their hundreds. With Toesun sniffing the deer, I had my hands full trying to keep him in check as we wandered along above the river bank, enjoying the rustic pleasures that abounded around us. 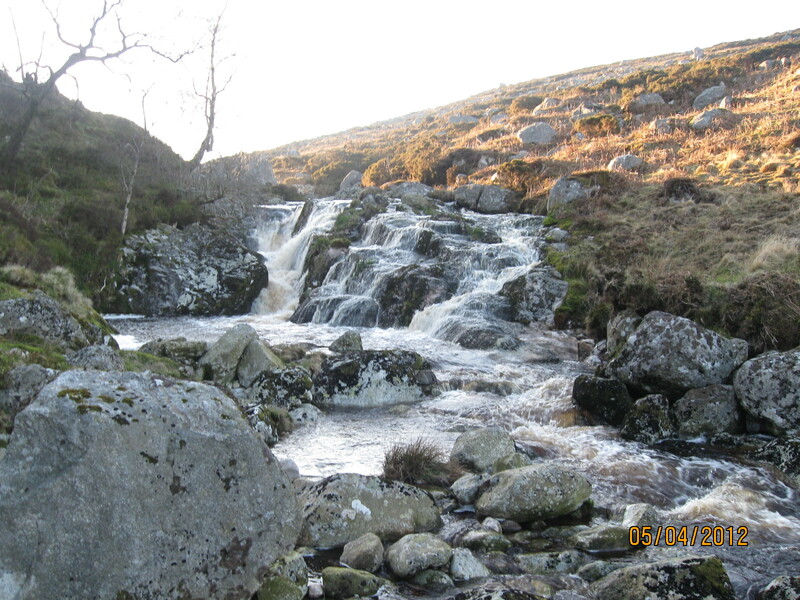 Following a rough roadway, we eventually made it to Lough Dan, where a beautiful spectacle awaited us. 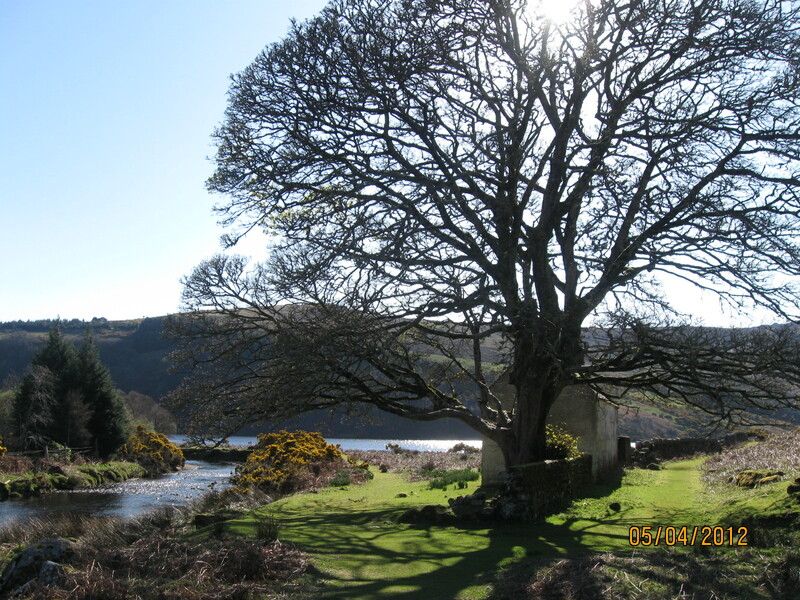 With the afternoon sun shining through it, an oak tree welcomed us to the northern shore of the lough. Away from the deer now, Toesun was at last able to wander around sniffing the hedges and paddling in the stream. 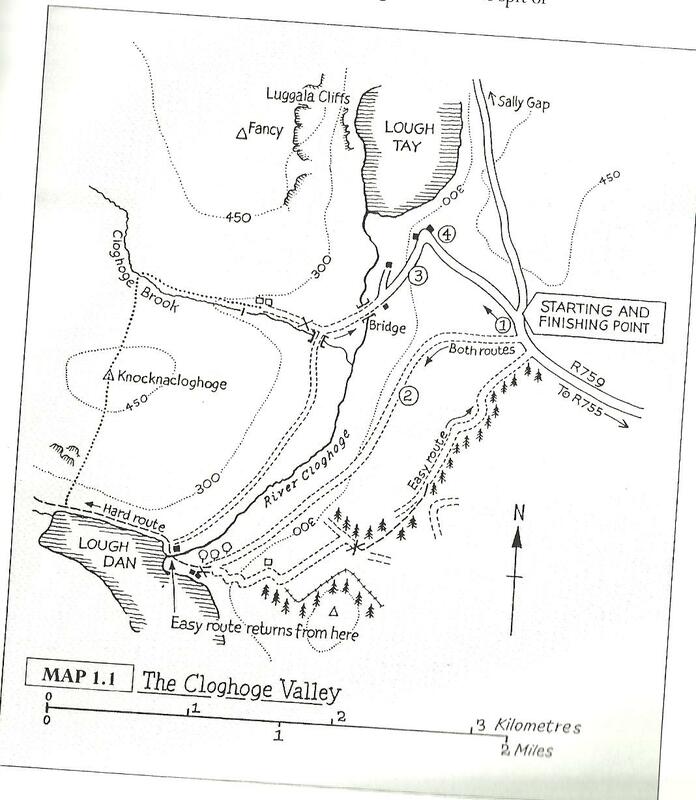 From here, I followed the directions along the shore to the beach at the northwest corner of the lough and looked up at the very steep climb that was to take me to the peak of Knocnacloghoge, towering above us. Girding my loins, I started up the sheer side of the hill, resting every 30 steps or so. With Toesun taking some of the workload, I allowed him lead the way, holding firmly to his lead as he worked his way up, rock by rock. The stops allowed me to enjoy the fantastic scenery that was unfolding below us, the Wicklow Mountains were in view over the vista of Lough Dan. Near the top, we stopped for another rest break and snacks. 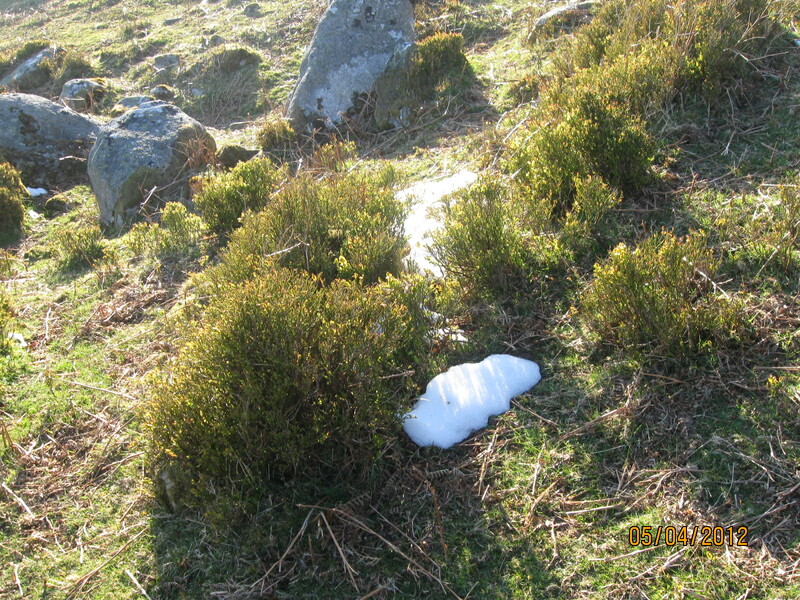 Around us were small remnants of the snow that had fallen on the mountains earlier in the week – very cooling on my sweaty brow. After taking nearly an hour to climb up the 150m or so, I was glad to be able to move freely again once we crested the top. Our taget now was the peak of Knocknacloghoge Mountain across heather on mixed peaty and rocky ground. With the sun now on it’s evening retreat, it was important for us to keep moving and we eventually made it to our goal. 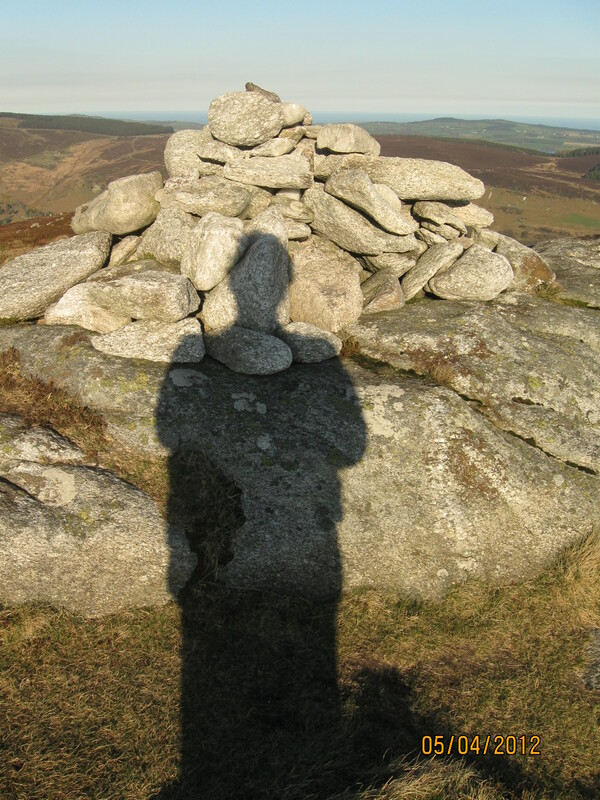 My shadow made it to the top! Looking down the northern slope to Cloghoge Brook, I could see it was a lot kinder looking than the formidable southern slope we had just ascended. Setting off down the boggy slope, we made it to the right bank of the brook, but try as we may, there was no handy crossing point to get onto the recommended left bank. So with the sun dropping in the sky, I decided to keep following the bank down towards the valley floor. It was tricky at times but we made it in about 30 minutes. The final leg was to work our way back up the roadway from the de Brun homestead, climbing to the car. In all we covered about 10kms (6 miles) in 4 hours. However, the climb from the shore of Lough Dan to the top of the mountain, a distance of c. 350m, took one and a half hours of that time. My dodgy knees survived, my muscles ached but it was a fabulous experience and a good tester for my upcoming Camino walk. This entry was posted in Uncategorized by Charlie Kavanagh. Bookmark the permalink.